"Namibian" redirects here. For other uses, see Namibian (disambiguation). Namibia (pronunciation:/nəˈmɪbiə/ ( listen), /næˈ-/), officially the Republic of Namibia, is a country in southern Africa. Its western border is the Atlantic Ocean; it shares land borders with Zambia and Angola to the north, Botswana to the east and South Africa to the south and east. Although it does not border Zimbabwe, less than 200 metres of the Zambezi River (essentially a small bulge in Botswana to achieve a Botswana/Zambia micro-border) separates the two countries. Namibia gained independence from South Africa on 21 March 1990, following the Namibian War of Independence. 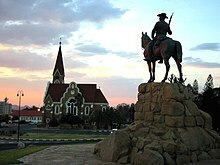 Its capital and largest city is Windhoek, and it is a member state of the United Nations (UN), the Southern African Development Community (SADC), the African Union (AU), and the Commonwealth of Nations. 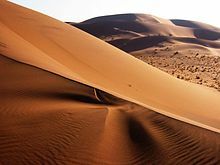 The name of the country is derived from the Namib Desert, considered to be the oldest desert in the world. 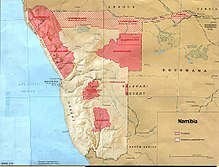 The name Namib itself is of Nama origin and means "vast place". Before its independence in 1990, the area was known first as German South-West Africa (Deutsch-Südwestafrika), then as South-West Africa, reflecting the colonial occupation by the Germans and the South Africans (technically on behalf of the British crown reflecting South Africa's dominion status within the British Empire). San people are Namibia's oldest indigenous inhabitants. The dry lands of Namibia have been inhabited since early times by San, Damara, and Nama. Around the 14th century, immigrating Bantu people began to arrive during the Bantu expansion from central Africa. From the late 18th century onward, Oorlam people from Cape Colony crossed the Orange River and moved into the area that today is southern Namibia. Their encounters with the nomadic Nama tribes were largely peaceful. They received the missionaries accompanying the Oorlam very well, granting them the right to use waterholes and grazing against an annual payment. On their way further north, however, the Oorlam encountered clans of the Herero at Windhoek, Gobabis, and Okahandja, who resisted their encroachment. The Nama-Herero War broke out in 1880, with hostilities ebbing only after the German Empire deployed troops to the contested places and cemented the status quo among the Nama, Oorlam, and Herero. The first Europeans to disembark and explore the region were the Portuguese navigators Diogo Cão in 1485 and Bartolomeu Dias in 1486, but the Portuguese did not try to claim the area. Like most of interior Sub-Saharan Africa, Namibia was not extensively explored by Europeans until the 19th century. At that time traders and settlers came principally from Germany and Sweden. In the late 19th century, Dorsland Trekkers crossed the area on their way from the Transvaal to Angola. Some of them settled in Namibia instead of continuing their journey. 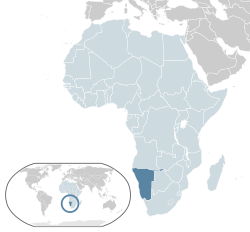 Namibia became a German colony in 1884 under Otto von Bismarck to forestall perceived British encroachment and was known as German South West Africa (Deutsch-Südwestafrika). The Palgrave Commission by the British governor in Cape Town determined that only the natural deep-water harbor of Walvis Bay was worth occupying and thus annexed it to the Cape province of British South Africa. From 1904 to 1907, the Herero and the Namaqua took up arms against brutal German colonialism. In calculated punitive action by the German occupiers, government officials ordered extinction of the natives in the Herero and Namaqua genocide. In what has been called the "first genocide of the 20th century", the Germans systematically killed 10,000 Nama (half the population) and approximately 65,000 Herero (about 80% of the population). The survivors, when finally released from detention, were subjected to a policy of dispossession, deportation, forced labor, racial segregation, and discrimination in a system that in many ways anticipated the apartheid established by South Africa in 1948. Most Africans were confined to so-called native territories, which under South African rule after 1949 were turned into "homelands" (Bantustans). Some historians have speculated that the German genocide in Namibia was a model for the Nazis in the Holocaust. The memory of genocide remains relevant to ethnic identity in independent Namibia and to relations with Germany. The German government formally apologized for the Namibian genocide in 2004. During World War I, South African troops under General Louis Botha occupied the territory and deposed the German colonial administration. The end of the war and the Treaty of Versailles left South Africa in possession of South West Africa as a League of Nations mandate. The mandate system was formed as a compromise between those who advocated for an Allied annexation of former German and Turkish territories and a proposition put forward by those who wished to grant them to an international trusteeship until they could govern themselves. It permitted the South African government to administer South West Africa until that territory's inhabitants were prepared for political self-determination. South Africa interpreted the mandate as a veiled annexation and made no attempt to prepare South West Africa for future autonomy. As a result of the Conference on International Organization in 1945, the League of Nations was formally superseded by the United Nations (UN) and former League mandates by a trusteeship system. Article 77 of the United Nations Charter stated that UN trusteeship "shall apply...to territories now held under mandate"; furthermore, it would "be a matter of subsequent agreement as to which territories in the foregoing territories will be brought under the trusteeship system and under what terms". The UN requested all former League of Nations mandates be surrendered to its Trusteeship Council in anticipation of their independence. South Africa declined to do so and instead requested permission from the UN to formally annex South West Africa, for which it received considerable criticism. When the UN General Assembly rejected this proposal, South Africa dismissed its opinion and began solidifying control of the territory. The UN responded by deferring to the International Court of Justice (ICJ), which held a number of discussions on the legality of South African rule between 1949 and 1966. Map depicting the Police Zone (in tan) and tribal homelands (in red) as they existed in 1978. Self-governing tribal homelands appear as tan with red stripes. South Africa began imposing apartheid, its codified system of racial segregation and discrimination, on South West Africa during the late 1940s. Black South West Africans were subject to pass laws, curfews, and a host of draconian residential regulations that heavily restricted their movement. Development was concentrated in the region of the country immediately adjacent to South Africa, formally called the "Police Zone", where most of the German colonial era settlements and mines were. Outside the Police Zone, indigenous peoples were restricted to theoretically self-governing tribal homelands. During the late 1950s and early 1960s, pressure for global decolonisation and national self-determination began mounting on the African continent; these factors had a radical impact on South West African nationalism. Early nationalist organisations such as the South West African National Union (SWANU) and South West African People's Organisation (SWAPO) made determined attempts to establish indigenous political structures for an independent South West Africa. In 1966, following the ICJ's controversial ruling that it had no legal standing to consider the question of South African rule, SWAPO launched an armed insurgency that escalated into part of a wider regional conflict known as the South African Border War. As SWAPO's insurgency intensified, South Africa's case for annexation in the international community continued to decline. The UN declared that South Africa had failed in its obligations to ensure the moral and material well-being of South West Africa's indigenous inhabitants and had thus disavowed its own mandate. On 12 June 1968, the UN General Assembly adopted a resolution proclaiming that, in accordance with the desires of its people, South West Africa be renamed Namibia. United Nations Security Council Resolution 269, adopted in August 1969, declared South Africa's continued occupation of Namibia illegal. In recognition of this landmark decision, SWAPO's armed wing was renamed the People's Liberation Army of Namibia (PLAN). Namibia became one of several flashpoints for Cold War proxy conflicts in southern Africa during the latter years of the PLAN insurgency. The insurgents sought out weapons and sent recruits to the Soviet Union for military training. SWAPO's political leadership, dependent on military aid from the Soviets, Cuba, and Angola, positioned the movement within the socialist bloc by 1975. This practical alliance reinforced the prevailing perspective of SWAPO as a Soviet proxy, which dominated Cold War ideology in South Africa and the United States. For its part, the Soviet Union supported SWAPO partly because it viewed South Africa as a regional Western ally. Growing war weariness and the reduction of tensions between the superpowers compelled South Africa, Angola, and Cuba to accede to the Tripartite Accord, under pressure from both the Soviet Union and the United States. South Africa accepted Namibian independence in exchange for Cuban military withdrawal from the region and an Angolan commitment to cease all aid to PLAN. PLAN and South Africa adopted an informal ceasefire in August 1988, and a United Nations Transition Assistance Group (UNTAG) was formed to monitor the Namibian peace process and supervise the return of refugees. The ceasefire was broken after PLAN made a final incursion into the territory, possibly as a result of misunderstanding UNTAG's directives, in March 1989. A new ceasefire was later imposed with the condition that the insurgents were to be confined to their external bases in Angola until they could be disarmed and demobilised by UNTAG. By the end of the 11-month transition period, the last South African troops had been withdrawn from Namibia, all political prisoners granted amnesty, racially discriminatory legislation repealed, and 42,000 Namibian refugees returned to their homes. Just over 97% of eligible voters participated in the country's first parliamentary elections held under a universal franchise. The United Nations plan included oversight by foreign election observers in an effort to ensure a free and fair election. SWAPO won a plurality of seats in the Constituent Assembly with 57% of the popular vote. This gave the party 41 seats, but not a two-thirds majority, which would have enabled it to draft the constitution on its own. The Namibian Constitution was adopted in February 1990. It incorporated protection for human rights and compensation for state expropriations of private property, and established an independent judiciary, legislature, and an executive presidency (the constituent assembly became the national assembly). The country officially became independent on 21 March 1990. Sam Nujoma was sworn in as the first President of Namibia at a ceremony attended by Nelson Mandela of South Africa (who had been released from prison the previous month) and representatives from 147 countries, including 20 heads of state. Upon the end of Apartheid in South Africa in 1994, the nation ceded Walvis Bay to Namibia. Since independence Namibia has completed the transition from white minority apartheid rule to parliamentary democracy. Multiparty democracy was introduced and has been maintained, with local, regional and national elections held regularly. Several registered political parties are active and represented in the National Assembly, although the SWAPO has won every election since independence. The transition from the 15-year rule of President Nujoma to his successor Hifikepunye Pohamba in 2005 went smoothly. Since independence, the Namibian government has promoted a policy of national reconciliation. It issued an amnesty for those who fought on either side during the liberation war. The civil war in Angola spilled over and adversely affected Namibians living in the north of the country. 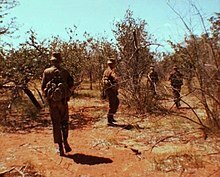 In 1998, Namibia Defence Force (NDF) troops were sent to the Democratic Republic of the Congo as part of a Southern African Development Community (SADC) contingent. In 1999, the national government quashed a secessionist attempt in the northeastern Caprivi Strip. The Caprivi conflict was initiated by the Caprivi Liberation Army (CLA), a rebel group led by Mishake Muyongo. It wanted the Caprivi Strip to secede and form its own society. Being situated between the Namib and the Kalahari deserts, Namibia has the least rainfall of any country in sub-Saharan Africa. 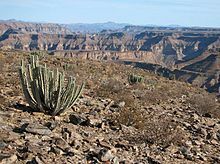 The Namibian landscape consists generally of five geographical areas, each with characteristic abiotic conditions and vegetation, with some variation within and overlap between them: the Central Plateau, the Namib, the Great Escarpment, the Bushveld, and the Kalahari Desert. The Namib is a broad expanse of hyper-arid gravel plains and dunes that stretches along Namibia's entire coastline. It varies between 100 and many hundreds of kilometres in width. Areas within the Namib include the Skeleton Coast and the Kaokoveld in the north and the extensive Namib Sand Sea along the central coast. Namibia is primarily a large desert and semi-desert plateau. Namibia extends from 17°S to 25°S latitude: climatically the range of the sub-Tropical High Pressure Belt. Its overall climate description is arid, descending from the Sub-Humid [mean rain above 500 mm (20 in)] through Semi-Arid [between 300 and 500 mm (12 and 20 in)] (embracing most of the waterless Kalahari) and Arid [from 150 to 300 mm (6 to 12 in)] (these three regions are inland from the western escarpment) to the Hyper-Arid coastal plain [less than 100 mm (4 in)]. Temperature maxima are limited by the overall elevation of the entire region: only in the far south, Warmbad for instance, are mid-40 °C (100 °F) maxima recorded. Typically the sub-Tropical High Pressure Belt, with frequent clear skies, provides more than 300 days of sunshine per year. It is situated at the southern edge of the tropics; the Tropic of Capricorn cuts the country about in half. The winter (June – August) is generally dry. Both rainy seasons occur in summer: the small rainy season between September and November, the big one between February and April. Humidity is low, and average rainfall varies from almost zero in the coastal desert to more than 600 mm (24 in) in the Caprivi Strip. Rainfall is highly variable, and droughts are common. The last[update] rainy season with rainfall far below the annual average occurred in summer 2006/07. Weather and climate in the coastal area are dominated by the cold, north-flowing Benguela Current of the Atlantic Ocean, which accounts for very low precipitation (50 mm (2 in) per year or less), frequent dense fog, and overall lower temperatures than in the rest of the country. 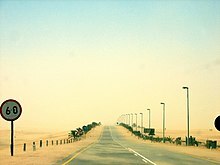 In Winter, occasionally a condition known as Bergwind (German for "mountain breeze") or Oosweer (Afrikaans for "east weather") occurs, a hot dry wind blowing from the inland to the coast. As the area behind the coast is a desert, these winds can develop into sand storms, leaving sand deposits in the Atlantic Ocean that are visible on satellite images. The Central Plateau and Kalahari areas have wide diurnal temperature ranges of up to 30 °C (54 °F). Namibia is the driest country in sub-Saharan Africa and depends largely on groundwater. With an average rainfall of about 350 mm (14 in) per annum, the highest rainfall occurs in the Caprivi in the northeast (about 600 mm (24 in) per annum) and decreases in a westerly and southwesterly direction to as little as 50 mm (2 in) and less per annum at the coast. The only perennial rivers are found on the national borders with South Africa, Angola, Zambia, and the short border with Botswana in the Caprivi. In the interior of the country, surface water is available only in the summer months when rivers are in flood after exceptional rainfalls. Otherwise, surface water is restricted to a few large storage dams retaining and damming up these seasonal floods and their runoff. Where people do not live near perennial rivers or make use of the storage dams, they are dependent on groundwater. Even isolated communities and those economic activities located far from good surface water sources, such as mining, agriculture, and tourism, can be supplied from groundwater over nearly 80% of the country. More than 100,000 boreholes have been drilled in Namibia over the past century. One third of these boreholes have been drilled dry. An aquifer called Ohangwena II, on both sides of the Angola-Namibia border, was discovered in 2012. It has been estimated to be capable of supplying the 800,000 people in the North for 400 years, at the current (2018) rate of consumption. Experts estimate that Namibia has 7,720 km3 (1,850 cu mi) of underground water. In 1993, Namibia's newly formed government received funding from the United States Agency for International Development (USAID) through its Living in a Finite Environment (LIFE) Project. The Ministry of Environment and Tourism, with financial support from organisations such as USAID, Endangered Wildlife Trust, WWF, and Canadian Ambassador's Fund, together form a Community Based Natural Resource Management (CBNRM) support structure. The project's main goal is to promote sustainable natural resource management by giving local communities rights to wildlife management and tourism. Namibia is a unitary semi-presidential representative democratic republic. The President of Namibia is elected to a five-year term and is both the head of state and the head of government. All members of the government are individually and collectively responsible to the legislature. Executive: Executive power is exercised by the President and the Government. Legislature: Namibia has a bicameral Parliament with the National Assembly as lower house, and the National Council as the upper house. Namibia has a largely independent foreign policy, with persisting affiliations with states that aided the independence struggle, including Cuba. With a small army and a fragile economy, the Namibian government's principal foreign policy concern is developing strengthened ties within the Southern African region. A dynamic member of the Southern African Development Community, Namibia is a vocal advocate for greater regional integration. It became the 160th member of the UN on 23 April 1990. On its independence it became the 50th member of the Commonwealth of Nations. Namibia does not have any enemies in the region, though it has been involved in various disputes regarding borders and construction plans. It consistently spends more as a percentage of GDP on its military than all of its neighbours except Angola. Military expenditure rose from 2.7% of GDP in 2000 to 3.7% in 2009, and the arrival of 12 Chengdu J-7 Airguard jets in 2006 and 2008 made Namibia for a short time one of the top arms importers in Sub-Saharan Africa. By 2015 military expenditure was estimated at between 4% and 5% of GDP. The Namibian constitution defines the role of the military as "defending the territory and national interests." Namibia formed the Namibian Defence Force (NDF), comprising former enemies in a 23-year bush war: the People's Liberation Army of Namibia (PLAN) and South West African Territorial Force (SWATF). The British formulated the plan for integrating these forces and began training the NDF, which consists of a small headquarters and five battalions. Namibia has a highly developed banking sector with modern infrastructure, such as online banking and cellphone banking. The Bank of Namibia (BoN) is the central bank of Namibia responsible for performing all other functions ordinarily performed by a central bank. There are 5 BoN authorised commercial banks in Namibia: Bank Windhoek, First National Bank, Nedbank, Standard Bank and Small and Medium Enterprises Bank. In 2013, global business and financial news provider, Bloomberg, named Namibia the top emerging market economy in Africa and the 13th best in the world. Only four African countries made the Top 20 Emerging Markets list in the March 2013 issue of Bloomberg Markets magazine, and Namibia was rated ahead of Morocco (19th), South Africa (15th) and Zambia (14th). Worldwide, Namibia also fared better than Hungary, Brazil and Mexico. Bloomberg Markets magazine ranked the top 20 based on more than a dozen criteria. The data came from Bloomberg's own financial-market statistics, IMF forecasts and the World Bank. The countries were also rated on areas of particular interest to foreign investors: the ease of doing business, the perceived level of corruption and economic freedom. In order to attract foreign investment, the government has made improvement in reducing red tape resulted from excessive government regulations, making Namibia one of the least bureaucratic places to do business in the region. Facilitation payments are occasionally demanded by customs due to cumbersome and costly customs procedures. Namibia is also classified as an Upper Middle Income country by the World Bank, and ranks 87th out of 185 economies in terms of ease of doing business. The cost of living in Namibia is relatively high because most goods, including cereals, need to be imported. Its capital city, Windhoek, is the 150th most expensive place in the world for expatriates to live. Taxation in Namibia includes personal income tax, which is applicable to total taxable income of an individual. All individuals are taxed at progressive marginal rates over a series of income brackets. The value added tax (VAT) is applicable to most of the commodities and services. Despite the remote nature of much of the country, Namibia has seaports, airports, highways, and railways (narrow-gauge). It seeks to become a regional transportation hub; it has an important seaport and several landlocked neighbours. The Central Plateau already serves as a transportation corridor from the more densely populated north to South Africa, the source of four-fifths of Namibia's imports. According to recent statistics on the country's income share held by the highest 10%, Namibia is a country with a substantive income disparity. The data indicates that the current income share held by the highest 10% is approximately 51.8%. This disparity illustrates the large gap between the rich and the poor. An additional figure describes the poverty gap: people living on US$2 or less in the country are approximately 17.72% of the population. About half of the population depends on agriculture (largely subsistence agriculture) for its livelihood, but Namibia must still import some of its food. Although per capita GDP is five times the per capita GDP of Africa's poorest countries, the majority of Namibia's people live in rural areas and have a subsistence way of life. Namibia has one of the highest rates of income inequality in the world, due in part to the fact that there is an urban economy and a more rural cashless economy. The inequality figures thus take into account people who do not actually rely on the formal economy for their survival. Although arable land accounts for only 1% of Namibia, nearly half of the population is employed in agriculture. Agreement has been reached on the privatisation of several more enterprises in coming years, with hopes that this will stimulate much needed foreign investment, but reinvestment of environmentally derived capital has hobbled Namibian per capita income. One of the fastest growing areas of economic development in Namibia is the growth of wildlife conservancies. These are particularly important to the rural, generally unemployed, population. Domestic supply voltage is 220 V AC. Electricity is generated mainly by thermal and hydroelectric power plants. Non-conventional methods of electricity generation also play some role. Encouraged by the rich uranium deposits the Namibian government plans to erect its first nuclear power station by 2018, also uranium enrichment is envisaged to happen locally. Although much of the world's diamond supply comes from what have been called African blood diamonds, Namibia has managed to develop a diamond mining industry largely free of the kinds of conflict, extortion, and murder that have plagued many other African nations with diamond mines. This has been attributed to political dynamics, economic institutions, grievances, political geography, and the effects of neighborhoods, and is the result of a joint agreement between the government and De Beers that has led to a taxable base, strengthening state institutions. 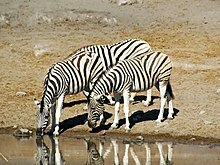 An example of Namibian wildlife, the plains zebra, is one focus of tourism. Tourism is a major contributor (14.5%) to Namibia's GDP, creating tens of thousands of jobs (18.2% of all employment) directly or indirectly and servicing over a million tourists per year. The country is a prime destination in Africa and is known for ecotourism, which features Namibia's extensive wildlife. There are many lodges and reserves to accommodate eco-tourists. Sport and trophy hunting is also a large and growing component of the Namibian economy, accounting for 14% of total tourism in the year 2000, or 19.6 million US dollars, with Namibia boasting numerous species sought after by international sport hunters. In addition, extreme sports such as sandboarding, skydiving and 4x4ing have become popular, and many cities have companies that provide tours. The most visited places include the capital city of Windhoek, Caprivi Strip, Fish River Canyon, Sossusvlei, the Skeleton Coast Park, Sesriem, Etosha Pan and the coastal towns of Swakopmund, Walvis Bay and Lüderitz. Windhoek plays a very important role in Namibia's tourism due to its central location and close proximity to Hosea Kutako International Airport. According to The Namibia Tourism Exit Survey, which was produced by the Millennium Challenge Corporation for the Namibian Directorate of Tourism, 56% of all tourists visiting Namibia in 2012–13 visited Windhoek. Many of Namibia's tourism related parastatals and governing bodies such as Namibia Wildlife Resorts, Air Namibia and the Namibia Tourism Board as well as Namibia's tourism related trade associations such as the Hospitality Association of Namibia are headquartered in Windhoek. There are also a number of notable hotels in Windhoek, such as Windhoek Country Club Resort, and some international hotel chains, such as Avani Hotels and Resorts and Hilton Hotels and Resorts. Apart from residences for upper and middle class households, sanitation is insufficient in most residential areas. Private flush toilets are too expensive for virtually all residents in townships due to their water consumption and installation cost. As a result, access to improved sanitation has not increased much since independence: in Namibia's rural areas 13% of the population had more than basic sanitation, up from 8% in 1990. Many of Namibia's inhabitants have to resort to "flying toilets", plastic bags to defecate into, which after use are flung into the bush. The use of open areas close to residential land for urination and defecation is very common and has been identified as a major health hazard. Namibia has the second-lowest population density of any sovereign country, after Mongolia. The majority of the Namibian population is of Bantu-speaking origin—mostly of the Ovambo ethnicity, which forms about half of the population—residing mainly in the north of the country, although many are now resident in towns throughout Namibia. Other ethnic groups are the Herero and Himba people, who speak a similar language, and the Damara, who speak the same "click" language as the Nama. In addition to the Bantu majority, there are large groups of Khoisan (such as Nama and San), who are descendants of the original inhabitants of Southern Africa. The country also contains some descendants of refugees from Angola. There are also two smaller groups of people with mixed racial origins, called "Coloureds" and "Basters", who together make up 8.0% (with the Coloureds outnumbering the Basters two to one). There is a substantial Chinese minority in Namibia; it stood at 40,000 in 2006. Whites (mainly of Afrikaner, German, British and Portuguese origin) make up between 4.0 and 7.0% of the population. Although their proportion of the population decreased after independence due to emigration and lower birth rates, they still form the second-largest population of European ancestry, both in terms of percentage and actual numbers, in Sub-Saharan Africa (after South Africa). The majority of Namibian whites and nearly all those who are mixed race speak Afrikaans and share similar origins, culture, and religion as the white and coloured populations of South Africa. A large minority of whites (around 30,000) trace their family origins back to the German settlers who colonized Namibia prior to the British confiscation of German lands after World War I, and they maintain German cultural and educational institutions. Nearly all Portuguese settlers came to the country from the former Portuguese colony of Angola. The 1960 census reported 526,004 persons in what was then South West Africa, including 73,464 whites (14%). Namibia conducts a census every ten years. After independence the first Population and Housing Census was carried out in 1991; further rounds followed in 2001 and 2011. The data collection method is to count every person resident in Namibia on the census reference night, wherever they happen to be. This is called the de facto method. For enumeration purposes the country is demarcated into 4,042 enumeration areas. These areas do not overlap with constituency boundaries to get reliable data for election purposes as well. The 2011 Population and Housing Census counted 2,113,077 inhabitants. Between 2001 and 2011 the annual population growth was 1.4%, down from 2.6% in the previous ten-year period. The Christian community makes up 80%–90% of the population of Namibia, with at least 75% being Protestant, and at least 50% Lutheran. Lutherans are the largest religious group, a legacy of the German and Finnish missionary work during the country's colonial times. 10%–20% of the population hold indigenous beliefs. Missionary activities during the second half of the 19th century resulted in many Namibians converting to Christianity. Today most Christians are Lutheran, but there also are Roman Catholic, Methodist, Anglican, African Methodist Episcopal, Dutch Reformed and Mormons (The Church of Jesus Christ of Latter-day Saints). Islam in Namibia is subscribed to by about 9,000 people, many of them Nama. Namibia is home to a small Jewish community of about 100. Although its official language is English, Namibia is a multilingual country as is illustrated by these examples in English, German, Afrikaans and Oshiwambo. Up to 1990, English, German, and Afrikaans were official languages. Long before Namibia's independence from South Africa, SWAPO was of the opinion that the country should become officially monolingual, choosing this approach in contrast to that of its neighbour South Africa (which granted all 11 of its major languages official status), which it saw as "a deliberate policy of ethnolinguistic fragmentation." Consequently, SWAPO instituted English as Namibia's sole official language though only about 3% of the population speaks it as a home language. Its implementation is focused on the civil service, education and the broadcasting system, especially the state broadcaster NBC. Some other languages have received semi-official recognition by being allowed as medium of instruction in primary schools. Private schools are expected to follow the same policy as state schools, and "English language" is a compulsory subject. Some critics argue that, as in other postcolonial African societies, the push for monolingual instruction and policy has resulted in a high rate of school dropouts and of individuals whose academic competence in any language is low. According to the 2011 census, the most common languages are Oshiwambo (the most spoken language for 49% of households), Nama/Damara (11.3%), Afrikaans (10.4%), Kavango (9%), and Otjiherero (9%). The most widely understood national language is Afrikaans, the country's lingua franca. Both Afrikaans and English are used primarily as a second language reserved for public communication. A complete list of languages according to the 2011 census is 48.9% Oshiwambo, 11.3% Nama/Damara, 10.4% Afrikaans, 8.6% Otjiherero, 8.5% Kavango, 4.8% Caprivi Languages, 3.4% English, 1.2% Other African Languages, 0.9% German, 0.8% San, 0.7% Other European Languages, 0.3% Setswana, and 0.1% Asian Languages. Most of the white population speaks either German or Afrikaans. Even today, 104 years after the end of the German colonial era, German plays a role as a commercial language. Afrikaans is spoken by 60% of the white community, German by 32%, English by 7% and Portuguese by 4–5%. Geographical proximity to Portuguese-speaking Angola explains the relatively high number of Portuguese speakers; in 2011 these were estimated to be 100,000, or 4–5% of the total population. 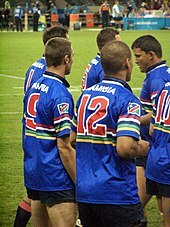 The most successful national team is the Namibian rugby team, having competed in five separate World Cups. Namibia were participants in the 1999, 2003, 2007, 2011 and 2015 Rugby World Cups. Cricket is also popular, with the national side having played in the 2003 Cricket World Cup. In December 2017, Namibia Cricket reached the final of the Cricket South Africa (CSA) Provincial One Day Challenge for the first time. In February 2018 Namibia hosted the ICC World Cricket League Division 2 with Namibia, Kenya, UAE, Nepal, Canada and Oman to compete for the final two ICC Cricket World Cup Qualifier positions in Zimbabwe. The most famous athlete from Namibia is Frankie Fredericks, sprinter in the 100 and 200 m events. He won four Olympic silver medals (1992, 1996) and also has medals from several World Athletics Championships. Golfer Trevor Dodds won the Greater Greensboro Open in 1998, one of 15 tournaments in his career. He achieved a career high world ranking of 78th in 1998. Professional cyclist and Namibian Road Race champion Dan Craven represented Namibia at the 2016 Summer Olympics in both the road race and individual time trial. Boxer Julius Indongo is the unified WBA, IBF, and IBO world champion in the Light welterweight division. Although Namibia's population is fairly small, the country has a diverse choice of media; two TV stations, 19 radio stations (without counting community stations), 5 daily newspapers, several weeklies and special publications compete for the attention of the audience. Additionally, a mentionable amount of foreign media, especially South African, is available. Online media are mostly based on print publication contents. Namibia has a state-owned Press Agency, called NAMPA. Overall c. 300 journalists work in the country. The first newspaper in Namibia was the German-language Windhoeker Anzeiger, founded 1898. During German rule, the newspapers mainly reflected the living reality and the view of the white German-speaking minority. The black majority was ignored or depicted as a threat. During South African rule, the white bias continued, with mentionable influence of the Pretoria government on the "South West African" media system. Independent newspapers were seen as a menace to the existing order, and critical journalists were often threatened. Current daily newspapers are the private publications The Namibian (English and other languages), Die Republikein (Afrikaans), Allgemeine Zeitung (German) and Namibian Sun (English) as well as the state-owned New Era (predominantly English). Except for the largest newspaper, The Namibian, which is owned by a trust, the other mentioned private newspapers are part of the Democratic Media Holdings. Other mentionable newspapers are the tabloid Informanté owned by TrustCo, the weekly Windhoek Observer, the weekly Namibia Economist, as well as the regional Namib Times. Current affairs magazines include Insight Namibia, Vision2030 Focus magazine and Prime FOCUS. The Sister Namibia magazine stands out as the longest running NGO magazine in Namibia, while Namibia Sport is the only national sport magazine. Furthermore, the print market is complemented with party publications, student newspapers and PR publications. Radio was introduced in 1969, TV in 1981. The broadcasting sector today is dominated by the state-run Namibian Broadcasting Corporation (NBC). The public broadcaster offers a TV station as well as a "National Radio" in English and nine language services in locally spoken languages. The nine private radio stations in the country are mainly English-language channels, except for Radio Omulunga (Oshiwambo) and Kosmos 94.1 (Afrikaans). Privately held One Africa TV has competed with NBC since the 2000s. Namibia has free education for both primary and secondary education levels. Grades 1–7 are primary level, grades 8–12 are secondary. In 1998, there were 400,325 Namibian students in primary school and 115,237 students in secondary schools. The pupil-teacher ratio in 1999 was estimated at 32:1, with about 8% of the GDP being spent on education. Curriculum development, educational research, and professional development of teachers is centrally organised by the National Institute for Educational Development (NIED) in Okahandja. Most schools in Namibia are state-run, but there are some private schools, which are also part of the country's education system. There are four teacher training universities, three colleges of agriculture, a police training college, and three universities: University of Namibia (UNAM), International University of Management (IUM) and Namibia University of Science and Technology (NUST). Life expectancy at birth is estimated to be 64 years in 2017 – among the lowest in the world. Namibia launched a National Health Extension Programme in 2012 deployment 1,800 (2015) of a total ceiling of 4,800 health extension workers trained for six months in community health activities including first aid, health promotion for disease prevention, nutritional assessment and counseling, water sanitation and hygiene practices, HIV testing and community-based antiretroviral treatment. Among eligible respondents age 35–64, more than 4 in 10 women (44 percent) and men (45 percent) have elevated blood pressure or are currently taking medicine to lower their blood pressure. Forty-nine percent of women and 61 percent of men are not aware that they have elevated blood pressure. Forty-three percent of women and 34 percent of men with hypertension are taking medication for their condition. Only 29 percent of women and 20 percent of men with hypertension are taking medication and have their blood pressure under control. Six percent of women and 7 percent of men are diabetic; that is, they have elevated fasting plasma glucose values or report that they are taking diabetes medication. An additional 7 percent of women and 6 percent of men are prediabetic. Sixty-seven percent of women and 74 percent of men with diabetes are taking medication to lower their blood glucose. Women and men with a higher-than-normal body mass index (25.0 or higher) are more likely to have elevated blood pressure and elevated fasting blood glucose. Overall, 26 percent of men age 15–49 and 32 percent of those age 50–64 have been circumcised. HIV prevalence for men age 15–49 is lower among circumcised (8.0 percent) than among uncircumcised men (11.9 percent). The pattern of lower HIV prevalence among circumcised than uncircumcised men is observed across most background characteristics. For each age group, circumcised men have lower HIV prevalence than those who are not circumcised; the difference is especially pronounced for men age 35–39 and 45–49 (11.7 percentage points each). The difference in HIV prevalence between uncircumcised and circumcised men is larger among urban than rural men (5.2 percentage points versus 2.1 percentage points). HIV prevalence among respondents age 15–49 is 16.9 percent for women and 10.9 percent for men. HIV prevalence rates among women and men age 50–64 are similar (16.7 percent and 16.0 percent, respectively). HIV prevalence peaks in the 35–39 age group for both women and men (30.9 percent and 22.6 percent, respectively). It is lowest among respondents age 15–24 (2.5–6.4 percent for women and 2.0–3.4 percent for men). Among respondents age 15–49, HIV prevalence is highest for women and men in Zambezi (30.9 percent and 15.9 percent, respectively) and lowest for women in Omaheke (6.9 percent) and men in Ohangwena (6.6 percent). In 76.4 percent of the 1,007 cohabiting couples who were tested for HIV in the 2013 NDHS, both partners were HIV negative; in 10.1 percent of the couples, both partners were HIV positive; and 13.5 percent of the couples were discordant (that is, one partner was infected with HIV and the other was not). As of 2015, the Ministry of Health and Social Services and UNAIDS produced a Progress Report in which UNAIDS projected HIV prevalence among 15 – 49 year olds at 13.3% [12.2% – 14.5%] and an estimated 210 000 [200 000 – 230 000] living with HIV. The malaria problem seems to be compounded by the AIDS epidemic. Research has shown that in Namibia the risk of contracting malaria is 14.5% greater if a person is also infected with HIV. The risk of death from malaria is also raised by approximately 50% with a concurrent HIV infection. The country had only 598 physicians in 2002. ^ "Communal Land Reform Act, Afrikaans" (PDF). Government of Namibia. Archived from the original (PDF) on 25 February 2016. Retrieved 18 February 2016. ^ "Communal Land Reform Act, Khoekhoegowab" (PDF). Government of Namibia. Archived from the original (PDF) on 25 February 2016. Retrieved 18 February 2016. ^ "Communal Land Reform Act, Oshiwambo" (PDF). Government of Namibia. Archived from the original (PDF) on 1 March 2016. Retrieved 18 February 2016. ^ "Communal Land Reform Act, Rukwangali" (PDF). Government of Namibia. Archived from the original (PDF) on 25 February 2016. Retrieved 18 February 2016. ^ "Communal Land Reform Act, Setswana" (PDF). Government of Namibia. Archived from the original (PDF) on 25 February 2016. Retrieved 18 February 2016. ^ "Communal Land Reform Act, Lozi" (PDF). Government of Namibia. Archived from the original (PDF) on 25 February 2016. Retrieved 18 February 2016. ^ a b Shugart, Matthew Søberg (September 2005). "Semi-Presidential Systems: Dual Executive and Mixed Authority Patterns" (PDF). Graduate School of International Relations and Pacific Studies. United States: University of California, San Diego. Archived from the original (PDF) on 19 August 2008. Retrieved 4 September 2016. ^ a b Shugart, Matthew Søberg (December 2005). "Semi-Presidential Systems: Dual Executive And Mixed Authority Patterns" (PDF). French Politics. 3 (3): 323–351. doi:10.1057/palgrave.fp.8200087. Retrieved 4 September 2016. Of the contemporary cases, only four provide the assembly majority an unrestricted right to vote no confidence, and of these, only two allow the president unrestricted authority to appoint the prime minister. These two, Mozambique and Namibia, as well as the Weimar Republic, thus resemble most closely the structure of authority depicted in the right panel of Figure 3, whereby the dual accountability of the cabinet to both the president and the assembly is maximized. (...) Namibia allows the president to dissolve [the assembly] at any time but places a novel negative incentive on his exercise of the right: He must stand for a new election at the same time as the new assembly elections. ^ a b "National Council". Parliament.gov.na (in Spanish). Retrieved 2017-08-26. ^ "CountryMeters – Namibia population". CountryMeters. Retrieved 7 February 2018. ^ a b c d "Report for Selected Countries and Subjects". IMF.org. International Monetary Fund. Retrieved 20 January 2019. ^ "GINI index (World Bank estimate)". data.worldbank.org. World Bank. Retrieved 20 January 2019. ^ Peter Shadbolt (24 October 2012). "Namibia country profile: moving on from a difficult past". CNN. ^ Dierks, Klaus. "Biographies of Namibian Personalities, A". Archived from the original on 15 October 2008. Retrieved 24 June 2010. ^ Dierks, Klaus. "Warmbad becomes two hundred years". Klausdierks.com. Retrieved 22 June 2010. ^ David Olusoga (18 April 2015). "Dear Pope Francis, Namibia was the 20th century's first genocide". The Guardian. Retrieved 26 November 2015. ^ Drechsler, Horst (1980). The actual number of deaths in the limited number of battles with the Germany Schutztruppe (expeditionary force) were limited; most of the deaths occurred after fighting had ended. The German military governor Lothar von Trotha issued an explicit extermination order, and many Herero died of disease and abuse in detention camps after being taken from their land. A substantial minority of Herero crossed the Kalahari desert into the British colony of Bechuanaland (modern-day Botswana), where a small community continues to live in western Botswana near to border with Namibia. Let us die fighting, originally published (1966) under the title Südwestafrika unter deutsche Kolonialherrschaft. Berlin: Akademie-Verlag. ^ Adhikari, Mohamed (2008). "'Streams of Blood And Streams of Money': New Perspectives on the Annihilation of the Herero and Nama Peoples of Namibia, 1904–1908". Kronos. 34 (34): 303–320. JSTOR 41056613. ^ Madley, Benjamin (2005). "From Africa to Auschwitz: How German South West Africa Incubated Ideas and Methods Adopted and Developed by the Nazis in Eastern Europe". European History Quarterly. 35 (3): 429–464. doi:10.1177/0265691405054218. says it influenced Nazis. ^ Andrew Meldrum (15 August 2004). "German minister says sorry for genocide in Namibia". The Guardian. Retrieved 26 October 2018. ^ a b c d Vandenbosch, Amry (1970). South Africa and the World: The Foreign Policy of Apartheid. Lexington: University Press of Kentucky. pp. 207–224. ISBN 978-0813164946. ^ First, Ruth (1963). Segal, Ronald, ed. South West Africa. Baltimore: Penguin Books, Incorporated. pp. 169–193. ISBN 978-0844620619. ^ Crawford, Neta (2002). Argument and Change in World Politics: Ethics, Decolonization, and Humanitarian Intervention. Cambridge: Cambridge University Press. pp. 333–336. ISBN 978-0521002790. ^ a b Herbstein, Denis; Evenson, John (1989). The Devils Are Among Us: The War for Namibia. London: Zed Books Ltd. pp. 14–23. ISBN 978-0862328962. ^ Müller, Johann Alexander (2012). The Inevitable Pipeline Into Exile. Botswana's Role in the Namibian Liberation Struggle. Basel, Switzerland: Basler Afrika Bibliographien Namibia Resource Center and Southern Africa Library. pp. 36–41. ISBN 978-3905758290. ^ a b c Yusuf, Abdulqawi (1994). African Yearbook of International Law, Volume I. The Hague: Martinus Nijhoff Publishers. pp. 16–34. ISBN 978-0-7923-2718-9. ^ Williams, Christian (October 2015). National Liberation in Postcolonial Southern Africa: A Historical Ethnography of SWAPO's Exile Camps. Cambridge: Cambridge University Press. pp. 73–89. ISBN 978-1107099340. ^ Hughes, Geraint (2014). My Enemy's Enemy: Proxy Warfare in International Politics. Brighton: Sussex Academic Press. pp. 73–86. ISBN 978-1845196271. ^ Bertram, Christoph (1980). Prospects of Soviet Power in the 1980s. Basingstoke: Palgrave Books. pp. 51–54. ISBN 978-1349052592. ^ Dreyer, Ronald (1994). Namibia and Southern Africa: Regional Dynamics of Decolonization, 1945-90. London: Kegan Paul International. pp. 73–87, 100–116. ISBN 978-0710304711. ^ Sechaba, Tsepo; Ellis, Stephen (1992). Comrades Against Apartheid: The ANC & the South African Communist Party in Exile. Bloomington: Indiana University Press. pp. 184–187. ISBN 978-0253210623. ^ a b Sitkowski, Andrzej (2006). UN peacekeeping: myth and reality. Westport, Connecticut: Greenwood Publishing Group. pp. 80–86. ISBN 978-0-275-99214-9. ^ Colletta, Nat; Kostner, Markus; Wiederhofer, Indo (1996). Case Studies of War-To-Peace Transition: The Demobilization and Reintegration of Ex-Combatants in Ethiopia, Namibia, and Uganda. Washington DC: World Bank. pp. 127–142. ISBN 978-0821336748. ^ a b c "Namibia Rebel Group Wins Vote, But It Falls Short of Full Control". The New York Times. 15 November 1989. Retrieved 2014-06-20. ^ "Treaty between the Government of the Republic of South Africa and the Government of the Republic of Namibia with respect to Walvis Bay and the off-shore Islands, 28 February 1994" (PDF). United Nations. ^ "Country report: Spotlight on Namibia". Commonwealth Secretariat. 25 May 2010. Archived from the original on 5 July 2010. ^ a b "IRIN country profile Namibia". IRIN. March 2007. Archived from the original on 17 February 2010. Retrieved 12 July 2010. ^ Brandt, Edgar (21 September 2012). "Land degradation causes poverty". New Era. ^ "Landsat.usgs.gov". Landsat.usgs.gov. Archived from the original on 7 September 2008. Retrieved 26 June 2010. ^ "NASA – Namibia's Coastal Desert". nasa.gov. Retrieved 9 October 2009. ^ "An Introduction to Namibia". geographia.com. Retrieved 9 October 2009. ^ "NACOMA – Namibian Coast Conservation and Management Project". nacoma.org.na. Archived from the original on 21 July 2009. Retrieved 9 October 2009. ^ Sparks, Donald L. (1984). "Namibia's Coastal and Marine Development Potential". African Affairs. 83 (333): 477. doi:10.1093/oxfordjournals.afraf.a097645. ^ "The Rainy Season". Real Namibia. Archived from the original on 6 September 2010. Retrieved 28 July 2010. ^ a b c "Namibia". Encyclopædia Britannica. Retrieved 28 July 2010. ^ Olszewski, John (13 May 2009). "Climate change forces us to recognise new normals". Namibia Economist. Archived from the original on 13 May 2011. ^ van den Bosch, Servaas (29 March 2011). "Heaviest floods ever in Namibia". The Namibian. ^ "Groundwater in Namibia". Integrated Water Resource Management. Archived from the original on 29 July 2016. ^ Greg Christelis & Wilhelm Struckmeier, eds. (2001). Groundwater in Namibia. ISBN 978-0-86976-571-5. Retrieved 2018-07-10 – via Namibian Hydrogeological Association. ^ MacDonald AM, Bonsor HC, Dochartaigh BÉ, Taylor RG (2012). "Quantitative maps of groundwater resources in Africa". Environ. Res. Lett. 7 (2): 024009. Bibcode:2012ERL.....7b4009M. doi:10.1088/1748-9326/7/2/024009. ^ a b "Constitution of the Republic of Namibia" (PDF). 1992. Archived from the original (PDF) on 19 January 2010. Retrieved 10 July 2018. "Namibia: Constitution". EISA. Archived from the original on 4 June 2012. ^ Article 41 of the Constitution of the Republic of Namibia. ^ "How to Register as a Voter". Electoral Commission of Namibia. Retrieved March 22, 2019. ^ Shivute, Peter (2008). "Foreword" (PDF). In Bösl, Anton; Horn, Nico. The Independence of the Judiciary in Namibia. Publications sponsored by Konrad Adenauer Stiftung. Macmillan Education Namibia. p. 10. ISBN 978-99916-0-807-5. ^ "SWAPO:Dominant party?". Swapoparty.org. Retrieved 2017-08-26. ^ "Africa and the CON". Africanhistory.about.com. Retrieved 2017-08-26. ^ Hopwood, Graham (February 2012). "Flying high". insight Namibia. ^ "Further spending for Namibian military". Defenceweb.co.za. 16 April 2015. Retrieved 13 October 2015. ^ "Namibia Economy Profile 2014". Indexmundi.com. Retrieved 26 November 2015. ^ Nakale, Albertina Haindongo (9 August 2013). "President divides Kavango into two". New Era. via allafrica.com. Archived from the original on 21 December 2015. ^ "Namibia National Council". Inter-Parliamentary Union. Retrieved 14 July 2010. ^ "Namibia". The World Factbook. Central Intelligence Agency. ^ "Namibia". UCB Libraries GovPubs. Archived from the original on 3 March 2016. Retrieved 26 August 2017. ^ a b "Background Note:Namibia". US Department of State. 26 October 2010. Retrieved 2017-08-26. ^ "Namibia Labour Force Survey 2012". Namibia Statistics Agency. 9 April 2013. Archived from the original on 19 October 2013. ^ Ndjebela, Toivo (18 November 2011). "Mwinga speaks out on his findings". New Era. ^ "Namibia, Windhoek Cost of Living". Apatulator.com. Retrieved 2017-08-26. ^ "Mining in Namibia" (PDF). NIED. Archived from the original (PDF) on 10 May 2011. Retrieved 26 June 2010. ^ Oancea, Dan (6 November 2006). "Deep-Sea Mining and Exploration". Technology.infomine.com. Retrieved 2017-08-26. ^ Weidlich, Brigitte (7 January 2011). "Uranium: Saving or sinking Namibia?". The Namibian. Archived from the original on 13 January 2011. ^ Nathan Munier (1 March 2016). "Diamonds Without Blood: A Look at Namibia". South African Security. 9 (1): 21–41. doi:10.1080/19392206.2016.1132903. ^ Hartman, Adam (30 September 2009). "Tourism in good shape – Minister". The Namibian. Retrieved 2017-08-26. ^ Humavindu, Michael N.; Barnes, Jonothan I. (October 2003). "Trophy Hunting in the Namibian Economy: An Assessment. Environmental Economics Unit, Directorate of Environmental Affairs, Ministry of Environment and Tourism, Namibia". South African Journal of Wildlife Research. 33 (2): 65–70. ^ "Namibia top tourist destinations". Namibiatourism.com.na. Archived from the original on 27 December 2016. Retrieved 26 August 2017. ^ "Report on the Namibia Tourist Exit Survey 2012–2013" (PDF). Mcanamibia.org. Retrieved 2017-08-26. ^ "HAN Namibia". Hannamibia.com. Retrieved 2016-08-26. ^ "GOVERNMENT GAZETTE OF THE REPUBLIC OF NAMIBIA, NO. 3235 (2014)" (PDF). laws.parliament.na. 14 July 2004. Retrieved 2018-03-24. ^ "FENATA | Federation of Namibian Tourism Association in Namibia". Fenata.org. Retrieved 2016-03-08. ^ a b c d Banerjee, Sudeshna (2009). Ebbing Water, Surging Deficits: Urban Water Supply in Sub-Saharan Africa (PDF). Washington, DC: The International Bank for Reconstruction and Development / The World Bank. Archived from the original (PDF) on 4 March 2012. Retrieved 26 August 2017. ^ a b Smith, Jana–Mari (12 July 2011). "Red alert on sanitation and safe drinking water". The Namibian. Archived from the original on 31 May 2012. ^ "Independent UN expert urges Namibia to expand access to sanitation services". UN News Centre. United Nations News service. 11 July 2011. Retrieved 2017-08-26. ^ a b Tjihenuna, Theresia (2 April 2014). "More than 1 million Namibians defecate in open". The Namibian. Retrieved 2017-08-26. ^ Cloete, Luqman (28 April 2008). "Namibia is lagging behind on sanitation". The Namibian. ^ Deffner, Jutta; Mazambani, Clarence (September 2010). "Participatory empirical research on water and sanitation demand in central northern Namibia: A method for technology development with a user perspective" (PDF). CuveWaters Papers. Frankfurt (Main): Institute for Social-Ecological Research (ISOE). 7. Archived from the original (PDF) on 22 March 2012. ^ Population Division of the Department of Economic and Social Affairs of the United Nations Secretariat (2009). "Table A.1" (PDF). World Population Prospects: The 2008 Revision. New York: United Nations. Retrieved 12 March 2009. ^ a b c Central Intelligence Agency (2009). "Namibia". The World Factbook. Retrieved 23 January 2010. ^ "Flight from Angola". The Economist. 16 August 1975. Retrieved 10 September 2013. ^ "Census Summary Results". National Planning Commission of Namibia. Archived from the original on 11 January 2012. Retrieved 21 February 2012. ^ Kapitako, Alvine (8 August 2011). "Namibia: 2011 Census Officially Launched". Allafrica.com. Retrieved 2017-08-26. ^ "Methodology". National Planning Commission of Namibia. Archived from the original on 11 January 2012. Retrieved 21 February 2012. ^ a b Duddy, Jo Maré (28 March 2013). "Census gives snapshot of Namibia's population". The Namibian. Retrieved 2017-08-26. ^ "Table: Muslim Population by Country". Pew Research Center. 27 January 2011. Retrieved 13 March 2017. ^ "Islam in Namibia, making an impact". Islamonline.net. Retrieved 2017-08-26. ^ "Namibia: Virtual Jewish History Tour". Jewishvirtuallibrary.org. Retrieved 1 August 2013. ^ a b Kriger, Robert & Ethel (1996). Afrikaans Literature: Recollection, Redefinition, Restitution. Rodopi Bv Editions. pp. 66–67. ISBN 978-9042000513. ^ Tötemeyer, Andree-Jeanne. Multilingualism and the language policy for Namibian schools. PRAESA Occasional Papers No. 37. University of Cape Town. Cape Town:2010. ^ "Languages Spoken". GRN Portal. Government of Namibia. Archived from the original on 6 March 2017. Retrieved 17 March 2017. ^ "Namibia 2011 – Population and Housing Census Main Report" (PDF). Namibia Statistics Agency. Archived from the original (PDF) on 2 October 2013. Retrieved 10 September 2013. ^ "Table 4.2.2 Urban population by Census years (2001 and 2011)" (PDF). Namibia 2011 – Population and Housing Census Main Report. Namibia Statistics Agency. p. 39. Retrieved 24 August 2016. ^ Sasman, Catherine (15 August 2011). "Portuguese to be introduced in schools". The Namibian. Archived from the original on 22 December 2012. Retrieved 24 June 2012. ^ a b Helge Schütz (19 December 2017). "Namibia Cricket Year Review". Archived from the original on 2017-12-22. ^ "IAAF World Championships in Athletics". www.gbrathletics.com. Retrieved 2019-02-26. ^ Kahiurika, Ndanki; Ngutjinazo, Okeri (22 January 2019). "40 journalists lose jobs since 2016". The Namibian. p. 6. ^ "Press Freedom Index 2010". Reporters Without Borders. Archived from the original on 24 November 2010. Retrieved 12 December 2012. ^ "Press Freedom Index 2009". Reporters Without Borders. Archived from the original on 28 January 2012. Retrieved 26 August 2017. ^ "Press Freedom Index 2013". Archived from the original on 27 July 2014. Retrieved 24 June 2013. ^ "World Press Freedom Index". Reporters Without Borders. Archived from the original on 14 February 2014. Retrieved 25 April 2015. ^ "Life Expectancy ranks". The World Factbook. Retrieved 2017-08-26. ^ "Namibia: Health Extension Programme Will Bridge Gaps Â? Unicef". AllAfrica.com. 16 October 2012. Retrieved 26 August 2017. ^ "Going the extra mile to deliver health care" (PDF). unicef. 7 August 2015. ^ a b Ministry of Health and Social Services (2013); ICF Macro (2013) Namibia Demographic and Health Survey 2013[dhsprogram.com] This article incorporates text from this source, which is in the public domain. ^ Together We Are Ending AIDS in Namibia (PDF). Namibia AIDS Conference 2016: 28 to 30 November 2016. Archived from the original (PDF) on 16 January 2017. Retrieved 15 January 2017. ^ "UNAIDS World AIDS Day Report 2011" (PDF). UNAIDS. Retrieved 2017-08-26. ^ "Aidsinafrica.net". Aidsinafrica.net. Retrieved 2017-08-26. ^ "HIV and AIDS estimates (2015)". Unaids.org. Retrieved 2017-08-26. ^ Korenromp, E.L.; Williams, B.G. ; de Vlas, S.J. ; Gouws, E.; Gilks, C.F. ; Ghys, P.D. ; Nahlen, B.L. (2005). "Malaria Attributable to the HIV-1 Epidemic, Sub-Saharan Africa". Emerging Infectious Diseases. 11 (9): 1410–1419. doi:10.3201/eid1109.050337. PMC 3310631. PMID 16229771. ^ "WHO Country Offices in the WHO African Region" (PDF). Afro.who.int. Archived from the original (PDF) on 7 January 2010. Retrieved 26 June 2010. Vedder, Heinrich (1997). Das alte Südwestafrika. Südwestafrikas Geschichte bis zum Tode Mahareros 1890 [The old South-West Africa. South-West Africa's history until Maharero's death 1890] (in German) (7th ed.). Windhoek: Namibia Scientific Society. ISBN 978-0-949995-33-9. Olusoga, David; Erichsen, Casper W. (2010). The Kaiser's Holocaust: Germany's Forgotten Genocide. London: Farber and Farber. ISBN 978-0-571-23142-3. Christy, S. A. (2007). Namibian Travel Photography. Horn, N/Bösl, A (eds.). Human rights and the rule of law in Namibia, Macmillan Namibia, 2008. Horn, N/Bösl, A (eds.). The independence of the judiciary in Namibia, Macmillan Namibia, 2008. Fritz, Jean-Claude. La Namibie indépendante. Les coûts d'une décolonisation retardée, Paris, L'Harmattan, 1991. "Namibia". The World Factbook. Central Intelligence Agency.